Save yourself time and money while on vacation. After all you've already paid for your holiday, now is the time to kick back and enjoy it without a care in the world. 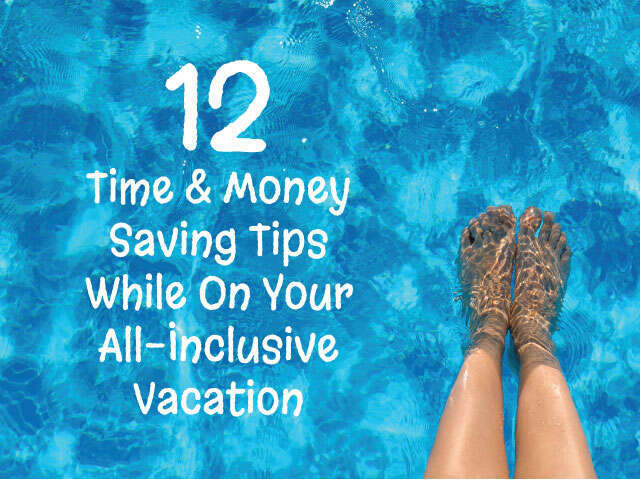 Earlier we wrote about 12 Money Saving Tips When Planning Your All-Inclusive Vacation. This time we are sharing our collective experience on how to help you save time and money once in destination and checked into your room. This will save you time. It is well worth attending the orientation, often times valuable information is shared here, such as how to best make a reservation for an a la carte dinner, booking excursions and of course tips on getting around the resort easily and quickly. You can also gather information on activities happening at the resort, so no need to worry about getting FOMO (fear of missing out). This ties in with the above item. Many of the non-buffet, higher-end restaurants get booked up quickly for reservations — so make them, and make them early. These restaurants are well worth it and give you an opportunity to try foods from around the globe. Did you know this was an option? If you have booked an early morning excursions or are simply heading off property you can often times pre request a meal to go. Never hurts to ask! If it’s included in the “all-inclusive” experience, of course you should ask first. If it is included, go for it! Why not relax and eat breakfast in bed or enjoy chips and salsa while watching late-night TV? This is the kind of stuff vacations are made of. As we pointed out in #4, it never hurts to ask. don’t be nervous to ask for what you want (or need). Kids amenities (cribs, cots, toys), bubble baths, extra hot sauce at the buffet — these resorts are often committed to providing a truly all-inclusive experience, so don’t feel bad asking for things you might not be sure are available. Be nice — the worst outcome is they don’t have this available. Tipping can be a tricky business at all-inclusive resorts, and unfortunately there is no “best practice” as it differs at each property — at some, employees aren’t allowed accept tips, some hotels include tips in the purchase price and at others they are appreciated but not expected. If you’re not able to figure it out feel free to ask the front desk or observe other guests once you’re there. If you are looking to adventure off property, make sure to chat with the concierge and find out what resources the hotel offers — often, they can hook you up with a shuttle or simply direct you toward the best local attractions. Take advantage of their knowledge — that’s what they’re there for! From passports to tablets, each of us travels with items that we’d be lost without. Before you travel, ask your UNIGLOBE Travel Expert if the hotel has an in-room safe. Most all-inclusive hotels offer small in-room safes (many not large enough for a laptop) and some have safes you can rent out at the front desk. The moment you arrive in your room, lock away your passports and travel documents because you won’t be needing them again until you depart. We suggest also using the in-room safe for phones and jewelry…but leave any expensive jewelry at home please. All-inclusive means ‘free food’, often times available all day or night. Please remember that you’re consuming different foods made with different oils and ingredients than you body may be used to. Your body may not always react the way you expect so for the first day go easy on your body and be aware of how you react. A common mistake is loading up on the plentiful fresh fruit, hammering back a slew of fruity cocktails and then spending the day in the sun. All that fruit juice, sugar and sun can wreak havoc on a digestive system – heads up. No, we are not talking about lining up the tequila shots. You likely will be spending a lot more time under the sun (and that is the strong tropical sun) and distracted with fun activities. Just like taking care of your skin on the outside with sunscreen, it is also critical to take care of your insides be drinking plenty of water and staying well hydrated. Filtered or bottled water is readily available at just about every resort nowadays, don’t be shy to ask the bartender for a fresh bottle or to refill one you brought from home. We are a in highly digitally-connected world now and all too often when we travel, we expect to have a strong signal like we are used to at home. You may purchase a travel plan for your mobile phone, but then discover once in destination the local cell towers aren’t reliable and you need to simply disconnected. Many all-inclusive resorts have WiFi packages you can purchase or common areas where it’s free, but again, the signal isn’t 100%. You can spend your days aimlessly sidestepping around the lobby trying to find a strong signal so you can update Facebook, or you can leave your iPad in your safe and enjoy the beautiful surrounds and warm hospitality. We suggest the latter. Many resorts have free water sports, introductory diving classes, cooking classes and more. Just ask to take advantage of these extras that are there for the taking!